The word for last weeks scripture challenge on Patter's blog: 'Triple the Scraps' was 'Name'. As always, Patter gave a wonderful teaching on the Names of God and asked her readers "When you call on the Lord how do YOU use His name?" Patter went on further to say "Praising God and expressing His attributes or NAMES helps us to remember who He is and reminds us to give Him all the glory". I thought deeply about everything Patter wrote and what the Names of God mean to me. For me, praising God thru music and seeing His majesty in nature is how I use His name. When I sing worship songs in church, I praise His Name, when I hear the birds singing I believe they are singing praises to their creator, and when I see God's beautiful, natural creations: like a brillantly colored fall tree, or a perfect flower, I am reminded of His Glorious Majesty. So when I created this card, I used the verse Patter quoted in her blog from Psalm 99:3 "Let them praise your great and awesome name". I stamped this verse with two different alphabet stamps: Hero Arts 'Bird Branch Alphabet' and the retired Stampin Up! Alphabet 'Brushstroke'. I wanted the word 'Name' to stand out, so I used the brushstroke alphabet for that one word. The bird and branch is from the same Hero Arts alphabet set. I colored it with my Stampin Up! markers. I adhered the words to scraps of pink, green, and yellow cardstock. The background cardstock is 'Tempting Turqoise' and 'Gable Green' from Stampin Up!. I added musical brads, silver adhesive crystals and ribbon for my embellishment. This weeks scripture challenge word on Patter's blog is 'Power'. Visit Patter's blog and come and play along with us! Here is my 6 x 4 Horizontal January Picture Calender. In previous posts I showed you a 5 x 7 calender and a 4 x 6 vertical scripture calender; all made using these $1.00 acrylic frames found at Walmart. For my picture calender, every month will depict a photograph of that season. Here I used a winter photograph of my house. I used old-fashioned photo corners so I could easily replace the picture with a different one. For the background, I used unknown designer paper that I picked up at the Dollar Store. I got a whole package of paper for only $1.00! Thrifty me again! I thought this 'country looking' paper went well with my old country home. The hearts are a cuttlebug die. I hand wrote the sentiment with a white gel pen. The calender can be downloaded from the same crafty secrets site I posted earlier for my scripture calender. I made this card for the 'Show Us Your Sheetload and Win - September '08 Contest.' I won 2nd place in the August contest, so I doubt I'll will again so soon, but I still wanted to play along. This month's prize is a $10.00 gift certificate to Scrap Attack Scrapbooking's Online Store. I've ordered from this site before and was pleased with both their selection and their service. If you'd like to play along, you can find all the details here: http://sheetload.blogspot.com/2008/09/show-us-your-sheetload-and-win.html If you've never visited the Sheetload of Cards Blog before, I encourage you to check it out. Its a great blog that gives the reader two sketches a month to download. Now onto the details of my card. I used the retired Stampin Up! set 'Circus Train' and colored it with my copic markers. The sentiment is from Hero Arts 'Cupcake Images'. I used the new Scallop Edge Punch from Stampin Up! for the blue border. The designer paper is unknown. I added a simple button and brads for embellishment. The photo corner is a Sizzix die. Blue, white and green cardstock were the colors I chose to match the designer paper. On Saturday I went with my best friend to the Warrens Cranberry Festival in Warrens, Wisconsin. We had so much fun looking at all the arts and crafts. I picked up some great metal accents for my garden and old printer's press drawer to mount on my craft room wall to hold my stamps. I probably could have bought 100 printing press drawers and still not have enough to hold all my stamps. LOL! I will post pictures of our grand adventure on Wednesday. If you read yesterdays post, I introduced acrylic calenders. Yesterday I posted a 5 x 7 calender. Today's calender is a 4 x 6 Scripture Calender. This calender will not only be a nice decorative accent for your home, but will also help you memorize scripture. If you commit one verse to memory per month, you'll have 12 scriptures completely memorized by the end of the year! January's verse is from Phillipians 4:13 "I can do all things through Him who strengthens me." This is one of my favorite verses, and I recite it to myself often whenever I feel insecure about something. The verse is from the retired Stampin Up! set "Elegant Inspirations". Its that time of year again...calender making time that is! I love to make my own calenders, that way I can personalize them to my taste! Last year I used my 'Bind-It-All' to make my calenders. It was a more traditional desk top calender where the pages flipped over once the month was over. But I like to keep my calender on my kitchen window sill and my beautiful pages kept getting splashed with water and ruined. So this year I found this cute little amazing acrylic frame at Walmart for only $1.00! Yes, you heard me right, only $1.00! They are shaped like an easel so they stand on their own. They come in many different sizes, but I purchased a 5 x 7 for this project. You can only fit one page in at a time, so I will just pre-make all my monthly pages and keep them safe and secure in a zip-loc baggy until its time to change them. To make this calender, first you need to download a printable calender. I got mine from the resource section on Splitcoaststampers.com. You can find it here: http://www.splitcoaststampers.com/forums/showthread.php?t=383876 I cut my base layer of pine green 5 x 7. I cut my second layer a tad smaller in white, then I stamped the images from the retired Stampin Up! set "Its Snow Time" and colored them with my copic markers and added stickles. Did you notice the coloring of my snowmen? Now, I'm NOT an artist, but I picked up a great tip from the blog "I Like Markers." The artist who writes that blog works for Copic Markers, and everyday she teaches people like me, who are not artists, how to color with the markers. One of her posts dealt with the subject of how to color white (like snow), other than just leaving the space white. Her tutorial showed how to use shades of grey to shadow parts of the snow. So I used my Warm Grey #1 marker to 'shadow' portions of the snowmen. Not bad for a first attempt! LOL! I then finished my image by adding blue chalk with a cotton ball to look like the sky. After I was done coloring, I adhered my calender to a piece of red cardstock and then attached that to the white cardstock and my first page of the calender year was completed. Tomorrow I'll be showing you a 4 x 6 upright Scripture Calender! Every page will have a different scripture and scene. This is perfect for memorizing scripture because with my bad memory, I NEED a whole month to memorize one verse! LOL! Plus, it gives plenty of time to think about that verse and what it really means to you. I also plan on showing pictures of a 4 x 6 horizontal 'Picture' calender. This project will feature a favorite personal photograph every month. My beloved husband and son are homebodies. They do not like to go ANYWHERE unless its a Christian Hard Rock Concert (which I DON'T like, Hard Rock is not my style of music). I, on the other hand, love to travel and attend 'unique' events. Well, one Saturday this summer I DRAGGED my family, as usual, to The International Children's Festival in St. Paul, Minnesota. I had a blast! The festival had great theatrical shows, a colorful parade, a tent filled with butterflies, and costumes and music from many different cultures. I could have stayed there for hours! But, as you can tell from the photo, my husband and son did not find anything amusing and would rather be any place else but there! LOL! Although I have already scrapbooked many wonderful, colorful pages of the event, I really wanted a page with my family members in it too. But this photograph? Ugh! They don't look like their having fun at all! So what does a scrapbooker do? Well, how about telling the truth and making light of it! Afterall, our pages should ultimately be 'truthful' and not a fake, wanna-be life, but our OWN lives, good or bad! So I titled my page 'Oh, Those Boys!' (since I often refer to the two remaining members living in my household as 'My Boys') and I journeled this: 'Bad Boys. Todd and Jordan never like to travel and see new things. They just tolerate my escapades. Oh well, at least they come along for the ride.' The other two pictures on the page are scenes of the parade. The background paper is "Urban Youth" from "Me and My Big Ideas" which I bought at Michaels. Isn't it fantastic? Its a great paper if you have a teenage son, and it came in a HUGE pad for $20.00 (but of course I used my 40% off coupon and I got it for only $11.00. Thrifty Me!). I chose this paper beause of the city skyline, and the Festival took place in Dowtown St. Paul. I used my cuttlebug and cuttlebug alphabet dies to make the title. The embellishment above the title is a metal brad. I used a dinner plate to cut the half circle out of red cardstock. So the next time one of your family members isn't coooperating for a photograph...take the pictue anyway! It makes for a VERY INTERESTING scrapbooking page! The pictures are of my daughter playing with the child of a friend of ours. Because I wanted Ashley to be the focus of the page, I placed a singular picture of her right next to the quote and then I highlighted with a frame. I also highlighted the word 'Bright' with a different color and the star. I added more stars (made with my cuttlebug and star die) to emphasize her bright spirit, and I put shiny glitter dots (Stickles) around the frame and in the background. I stamped my own background paper using the retired Stampin Up! 'CrossHatch' stamp. So do you have pictures that remind you of a specific quote or song? Type or stamp the words out, and use them on your page! 'Fairies' is one of my favorite stamp sets from 'Crafty Secrets'. I just love the whimsical, romantic images. For this card I stamped the image in versamark and then embossed it with black embossing powder. 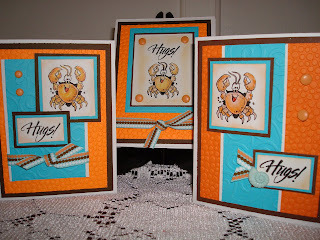 I used a cuttlebug embossing folder for the left panel and designer paper for the right panel. I added a sentiment from Stampin Up!s 'Angelic', dew drops, and a ribbon. I made this card for a Crafty Secret Challenge on Splitcoaststampers. The theme of the week was 'Friendship'. I chose this image because nothing says friendship more to me than when a friend lets you have all the fun in the swing while he/she pushes. LOL! Every week Splitcoaststampers.com sends out a newsletter to its subscribers. Within this newsletter is always a tutorial showing a new technique or project. This weeks tutorial is 'Striped Wipe' and you can find it here: http://www.splitcoaststampers.com/resources/tutorials/stripedwipe/. Their tutorials always include lots of pictures and easy to follow instructions. As you will find if you read the tutorial, the beautiful sunset background for this card was made using a baby wipe and reinkers. The reinkers I used are: Stampin Up! 'Purely Pomegrante' and "Groovy Guava', and "Designer Ink 'Whisper Chalk Pink'". The stamp set is Stampin Up! "Upsy Daisy". The Cardstock is Stampin Up! "Purely Pomegrante" and "Basic Black". Ribbon is 'Groovy Guava' also by Stampin Up!. This technique was really fun and so easy! If you've never tried it before, I highly encourage you too! You won't be sorry! One of my favorite blogs is 'Triple the Scraps'. Patter Cross has such a unique style and is also a great bible teacher. She was also recently chosen to be a designer for Creative Memories. So You might want to pop on over to her blog and congratulate her. Anyhow, once a week on her blog, she hosts a 'Scripture Challenge'. She picks a theme and verse out of the bible, gives a very good lesson on that verse, and then challenges you to make a card. Last weeks theme was 'Fear'. A very appropriate theme considering whats going on in our economy right now. The verse was Isaiah 43:5 "Do not be afraid, for I am with you". When I thought about this theme and how to put a card together, I remembered when I was younger and didn't know Jesus what I would do everytime I was afraid of something : I would sing the song that the cowardly lion in the broadway musical from 'The Wiz' sang. I know it sounds silly, but for some reason that song always gave me courage. The lyric that gave me courage was this 'I'm standing strong and tall, I'm the bravest one of all'. Now that I'm older, wiser, and a born-again believer, I don't need to sing Broadway songs to give me courage, I just need to remember scripture and draw my strenth from God's word. So when creating this card, I chose this Lion Image from 'Mindy's Zoo' because it not only reminded me of the cowardly lion from 'The Wiz', but also the lion that represented Jesus in "The Chronicles of Narnia." The sentiment on the inside of the card reads: "Whatever happens, God is there to keep you safe within his care." The sentiment is from the retired Stampin Up! Set 'Brighter Tomorrow.' I used 'Ruby Red', 'Not Quite Navy' , and 'Summer Sun' cardstock, also from Stampin Up!. The card front sentiment I created using my Image Tree Alphabet Stamps. I ran the 'Summer Sun' panel thru my cuttlebug using the 'Swiss Dots' embossing folder. The designer paper is from Michaels. I colored the image with copic markers, then added prima flowers, brads, and dew drops. I was recently introduced to Lace Cardstock for a challenge on Splitcoaststampers.com. I had never seen it before and fell madly in love with it and all its possibilities for a scrapbook page. Its basically regular cardstock that has a laser cut design on it. It comes in many different styles and two sizes 8 1/2 by 11 and 12 by 12. You can do anything to lace cardstock that you would do to regular cardstock. I cut mine to create a decorative edge to the page. This lace cardstock has words like 'Vacation', 'ocean', 'discover', etc. and flowers on it. I lifted the layout from the October issue of Scrapbooks etc. magazine. The title is cuttlebug. I used my coluzzle to cut the half circle on the top of the page. The flowers were cut from designer paper and the title is a cuttlebug alphabet die. The pictures are of my children and friends swimming in a lake. This page was also chosen for this weeks Scrapbooking Inspiration Challenge on Splitcoaststampers.com I felt so honored to be chosen. There is a HUGE blog candy on the blog http://myblogbycammie.blogspot.com. To participate you must create and send a card to an Alheimzer's caretaker. This is my submission. My family has had to deal with this disease twice. My husbands grandfather and my grandmother were both diagnosed with alheimzers. This card was also created for yesterday's featured stamper challenge on Splitcoaststampers.com. The featured stamper this week in Shannon, a.k.a E3Stamper. You can see her original card here: http://www.splitcoaststampers.com/gallery/photo/1013407?cat=500+ppuser=89875 I changed the stamp set, the background papers, ribbon, and added sewing to my card. My card has something called 'Microbeads' all over the main image. If you've never heard of microbeads before, they are fantastic! Their basically the tiniest little beads you ever saw (or can't see if your eyes are as bad as mine! LOL!) and you sprinkle them on like glitter. They have the nicest feel or texture...like touching glass, but its not smooth to the touch, you feel ridges. It really adds a lot of 'bling' and 'glamour' to your card. Both my background papers are cuttlebug embossing folders. I sewed them on the card with my sewing machine. I finished the card by adding adhesive crystals, black velvet ribbon and mounting both the main image panel and the bird up on dimensionals. The stamp sets are 'Upsy Daisy' from Stampin Up! and 'Birds Galore' by Inkadinkado. Paper is all by Stampin Up! : 'Pretty in Pink', "Purely Pomengrante', 'Pink Passion' and 'Basic Black'. I used my brayer and a cuttlebug circle die mask to create the scene behind the bird. I used 'Pixie Pink', 'Purely Pomegrante', and 'Basic Black' ink with versamark and black embossing powder. So if you want a chance at winning some great prizes, plus the opportunity to contribute to a worthy cause, head on over to Cammie's blog and play along! Have you ever been lacking inspiration for making a card or scrapbook page? Have you ever just stared at all that blank paper and wonder 'What do I do?' Well, look around you for inspiration! You can find ideas in your home, in magazines, on television, in nature. Splitcoaststampers.com has a challenge every Saturday regarding this concept. Its called 'The Inspiration Challenge'. Every week they feature a different 'Inspiration Piece' and challenge you to draw an idea from it and make a card. There are no other rules. Just 'create' whatever 'inspires' you from the piece. This weeks inspiration piece was 'Mondo Dishes' by Rosanna, Inc. and can be seen here:http://www.splitcoaststampers.com/forum/showthread.php?+=383748 I was inspired by the palm/bananna leaf in the dishes and the colors. So I pulled out my Stampendous 'Chanquito Monkeys' sets and stamped the leafs all over the background. I then stamped and colored my main image with copic markers and mounted it up on dimensionals. I added a ribbon as embellishment, and wa-la, my 'inspired' card is done. I didn't have to spend hours painstakingly trying to create something out of nothing. The paper colors and ribbon are 'Wild Wasabi' and 'Tempting Turqoise', all from Stampin Up! So now its your turn, look around your home and in magazines. What do you see? Here are some cards I made using a stamp set from Inkadinkinkado...another one of my favorite stamp companies! Don't you just love that name! Its so fun to say! This stamp set is called 'Birds Galore'. As most of you already know, I LOVE Birds and I collect a lot of bird stamps. This set is one of my favorites because the images are so romantic, beautiful, and have floral motifs in the images of the birds. I used only black, white, and 'Blush Blossom' paper by Stampin Up!. The backgrounds are created either with a cuttlebug embossing folder or miniture flowers from a 'Rubber Stamp Tapestry' set. Then I just added ribbon and brads to embellish and complete the cards. These cards were made for a Featured Stamper Challenge on Splitcoaststampers.com. The featured stamper was "Lost in the 60" and her cards can be seen here http://www.splitcoaststampers.com/gallery/photo/931353?cat=500+ppuser=104481 If you've never participated in a featured stamper challenge basically it goes like this: One stamper a week is 'featured' on splitcoast. The contestants then pick a card from the stampers gallery and recreate it. They must change three things about the card. I changed the colors, the ribbon, and the background paper on my cards. I donated these cards to a hospital who requested cards for women in their final stages of life due to cancer. This is a scrapbook page that uses felt as an embellishment. I simply drew a simple flower with a marker right on a piece of 20 cent felt and cut it out. The circular flower center were cut out with my cuttlebug....Yes! You can use your cuttlebug to cut felt too! The white portion of the flower is also a cuttlebug die. I adhered the 3 pieces of the flower to the page with a brad, then I hand stitched right onto the page with embroidery floss. The butterflies and the title are also cuttlebug dies. The pictures are of my garden in peak bloom! This is a scrapbook page I did awhile back on Splitcoaststampers.com for a mini VSBN challenge. It won the title of "Noteworthy Recognition". I was so excited to win the award, because it was the first time I ever won anything for my work. If you've never participated in a VSBN challenge before, its basically scrapbooking on speed. The participants are given specific challenges that have to be completed in a number of HOURS or days over the course of a weekend or week. I've never done the weekend VSBN's because my weekends are usually too filled with family events and I just don't scrapbook THAT fast. But I have participated in the challenges where they at least allow you a week or two to finish. That's more my speed! LOL! Now, onto the details of this page. The 'look' of this page is very much the style of what the trend is in the scrapbooking world: Mixing up designer papers, alphabets, journeling, etc. I've heard some scrappers refer to it as the 'graffiti look'. My page is more 'toned down' by the orderly picture layout and therefore has less 'graffiti style' to it. A true 'graffiti style' would have pictures, embellishments and designer paper thrown all over the place with no organized look to it whatsoever. The paper I used for this page came from a pack of papers from 'Magnolia' which you can mix and match. I used 2 different alphabet sets in the title: one is 'Doodle Alphabet' from Stampin Up! and the other is a mini alphabet from 'Image Tree'. The word 'Fun' was cut using my cuttlebug and cuttlebug alphabet dies. The pictures are of my daughter and her friends having fun at a college banquet. There are currently two new big trends in Card Making: Silhouette Images and Stitching. Silhouette images are all the rage right now in the stamping world. I think crafters like them because they are so quick and easy and a lot of stampers don't like to color. I personally LOVE to color, I find it so relaxing, so I've been avoiding purchasing Silhouette stamps, until now. Stampin Up! had several sets of silhouette stamps for 25% the regular catalog price, so I purchased some and gave them a try. I must admit for a 'coloring' girl, they were hard to get used to. But they come in handy when you need a 'fast' card. I find the best way to use silhouette stamps on a card is to use lots of other things to give it interest. For this card, I used different designer papers, ribbon, hardware, and stitching. Stitching is another current rage in the stamping world. You can hand-stitch or machine stitch RIGHT ON YOUR CARD! This card has a zig-zag stitch going all the way around the base of the card. Its very quick and easy, even if you've never sewed before. If you don't have a sewing machine, just do a basic back stitch by hand. Don't worry about it not looking perfect....its not suppose to! Thats the 'hand-made' touch! Heres the details of the card: All the paper is by Basic Grey. The stamp set is Stampin Up! "Pocket Silhouettes". I used $1.00 a spool ribbon from Michaels. I ran the ribbon thru a piece of "Hodgepodge Hardware" from Stampin Up!. I added a tag made with my cuttlebug and "Tiny Tags" cuttlebug die. I sponged the edges with Stampin Up! "Always Artichoke" ink. Stamped the main images with the same color ink. Used my 'Rectangles' nestablilites die for the main image panel. I hope I've encouraged you to give either silhouette stamps or stitching on your cards a try! Have a great day! One of my favorite stamp companies is 'Crafty Secrets'. They have a complete line of stamps, papers, stickers, etc., using vintage images. Well I love everything old, vintage, antiquey-looking, so I'm mad for anything made by 'Crafty Secrets'. Anyhow, on Splitcoaststampers.com they have a weekly Crafty Secrets challenge where you make a project using Crafty Secrets products. This weeks challenge was to make an ATC (Artist Trading Card) Card. Well I've seen ATC cards before, but I always thought they were kinda silly because I didn't know what I'd do with it after I made it, so I never made one before. In case you've never heard of an ATC card before, its basically a trading card (like baseball cards) for stampers. It has to be only 2.5 inches by 3.5 inches, and it DOES NOT open up like a normal card would. The other requirement of the challenge was to use three things in your card beginning with the letter 'P'. I used 'Pink', 'Piercing', and a 'Punch'. All the images are from the stamp set 'Cherish', THE most beautiful romantic/wedding stamp set I've ever seen! I colored the heart with copic markers, applied versamark, sprinkled with clear embossing powder, heat set it, and cut it out. The background is pierced then stamped with a scroll image from the set, then sponged with chalk and white ink. I used the 'Ticket Corner' punch from Stampin Up!. I added two different types of ribbon, and adhesive pearls and rhinestone. The heart is mounted up on dimensionals. I wish you all could see this card in real life. I had such a hard time getting a good photo of it. Its much prettier than the photo makes it out to be. As for what I'll do with this ATC Card, I think I'll sneak this little guy into my hubby's lunchbox sometime. He always has such a difficult time at work with co-workers being rude to him. It'll be a nice reminder of what really counts: The love of your family. On the blog 'Totally Random' which I am a creative team member of, one of the challenges was to create a page about ourselves listing some facts about us. Well, I've never done a page just about me before, I didn't even have any pictures of me! I'm always the one taking the pictures, I'm never actually in them! So I asked my dear husband if he would ever so kindly take some pictures of me, and he lovingly obliged, but his photography skills are quite limited. Thank goodness for digital cameras, I could 'fix' a lot of his photo mistakes. I also have a word of caution for those of you who may have to ask your hubbies to take pics of you....they have a hard time staying focused because they get other ideas when they have a digital camera in their hands, IF you know what I mean! LOL! Anyhow, back to the page. I used two different sheets of designer paper. One for my base and the other I cut in a circle using a dinner plate (great technology, I know...but it works! LOL). My Title is a mix of 'Doodle Alphabet' from Stampin Up! (retired), a cuttlebug die, and chipboard. I painted the chipboard letters ('Me') first, sponged two different colored inks on them (Stampin Up! "More Mustard" and 'Really Rust"), stamped with a flower stamp (from the set 'Flight of the Butterfly' also from Stampin UP! ), added stickles and a ribbon. I added more stickles on the stars of the stamped title. The other embellishments I added to the page are prima flowers, brads, and dew drops. I also used my cuttlebug to cut out stars to put behind the number '10'. In case you can't read my journeling, this is what it says: "1. I love animals, especially kittens, puppies, and birds. 2. I hate injustice. 3. I love to be at home. 4. I love Broadway musicals. 5. I'm creative, but not artistic. 6. I love flowers. 7. I feel closest to God in nature. 8. I love beauty and am always trying to recreat it. 9. I'm extremely loyal to those I love. 10. I'm a hard worker." I really enjoyed making this page. I definately think I'll make more pages of myself and hope to somehow put a book together. I think it'll be a great heirloom to pass on to my kids and/or grandkids. I suppose I'll have to make one of their father too. We don't want them to forget about him! LOL! This is a card I made for the weekly color challenge on Splitcoaststampers.com. If you've never played this challenge, you should give it a try. Its a lot of fun. Every tuesday they give you 3 Stampin Up! colors and challenge you to make a card with them. You can also use neutral colors (white, black, etc) on your card and different colors on your stamped image. The colors this week are 'Riding Hood Red', 'Basic Grey', and 'Always Artichoke'. Well I saw these colors and immediately thought of 'nature', 'earth tones', and 'masculine', so I made a masculine birthday card. I used my 'Nestabilities' to cut out the squares for the main image. I used my cuttlebug to emboss the 'Always Artichoke' panel. The name of the embossing folder is "Houndstooth". Isn't it a great texture? I used my computer to create the first part of the sentiment, the word 'Grrreat!' is a stamp in the same kit as the bear. Then I just added ribbon and mounted my sentiment panel up on dimensionals. The image is from the new Stampin Up! set 'Under the Stars'. Isn't that bear just adorable? Everytime I see him I'm not sure if he wants to hug me or eat me! LOL! The blog Sheetload of Cards had a sketch contest. I submitted this card and won 2nd place! I was so excited! I won a stamp set, a pad of paper, and some fibers. But the real 'win' for me was the honor of having my card chosen for 2nd place. If you've never visited the Sheetload of Cards blog before, I highly recommend it. You can find it here: http:// sheetload.blogspot.com Twice a month they give you a sketch you can download where you can make a bunch of cards out of one sheet of paper. Now onto the details of this card. The stamp set is Inkadinkado "Birds Galore". I stamped the main image in Stampin Up! 'Basic Black', then colored it with a versamarker, sprinkled clear embossing powder on it, heated it with a heat gun and then cut it out and mounted it up on the card with dimensionals. The three panels of birds is actually one stamp. I stamped the image and cut into squares. The background panel is the cuttlebug embossing folder 'Swiss Dots' and I sponged the edges with chalk. The paper is 'Blush Blossom" by Stampin Up! I added a $1.00 a spool ribbon from Michaels and adhesive pearls. The sentiment is from the stamp set "Happy Harmony" from Stampin Up! I made this card for a challenge on another blog called "No time To Stamp" where we were to make a card that had a 'warm, cozy feel'. Well nothing feels warmer and cozier to me that a hot beverage, dark colors, and texture! So these were the elements I added to my card! The images are retired Stampin Up! 'Like it a Latte". The Designer Paper is Basic Grey. I added ribbon and brads. The main image, heart, and sentiment are all popped up on dimensionals. Now, if its chilly where you are today, or maybe you just need a hug, sit down with a hot beverage and you will have that warm, cozy feeling again in no time! The first picture I decided to upload on my blog is a picture of me in my garden. Even though this blog will contain pictures and articles mostly of the cards and scrapbook pages I create, I also wanted to include other creative interests of mine as well, such as gardening, photography, and interior design. After all, the title and subject matter of my blog is 'Amy's Creative Pursuits" and creating beauty in all aspects of my life. This picture is a pic of my garden at its peak in the middle of summer. I'm 5'7 and you can see that the hollyhocks tower over me. The picture on the top of the page, behind my title, is also a pic of my garden, but taken in the early spring when the creeping phlox and crab apples are in bloom. I have close to 2 acreas of land on a steep hillside filled with flower gardens and trees. As the seasons change, I will always try to update you with a new pic of my garden. Have a good day.